Nazara Technologies Pvt Ltd, a mobile games developer and publisher, has partnered with Opera Commerce, a fully owned subsidiary of Opera Software, to deploy a mobile payment solution for Opera Mini users. 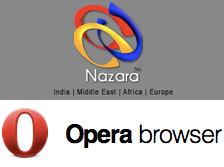 Nazara will deploy the Opera Payment Exchange (OPX) to enable Opera Mini users in India, Africa and the Middle East, as well as in Europe, to pay for mobile games via their post-paid mobile bills or prepaid balance. Launched in February 2012, the OPX acts as a platform connecting content providers, publishers, mobile billing systems & digital payment gateways and end-users. It enables mobile payment processing within the Opera Mini browser, resulting in higher transaction success rates. It also helps publishers and content providers (such as Nazara) to maximise the potential of their existing billing connections with carriers, payment instrument providers and payment gateways. Although India-specific numbers are not available, it is currently the largest market for Opera Mini, according to the company. As of April this year, the company also claimed to have 225 million users worldwide. "Mobile gaming is witnessing tremendous growth, which is due to several ecosystem trends like the rise in mobile connections, easy access to mobile internet and the rise of a mobile gaming culture. Micropayments for games have always been a challenge from the customers' point of view. With OPX, we will be able to simplify mobile payments and provide a safe and secure option to the entire Opera Mini user base," said Nitish Mittersain, CEO of Nazara Technologies. Nazara is focused on the large mobile consumer base in India, the Middle East and Africa, as well as other global markets. In addition to developing a range of original mobile games, the company also operates a 'Games Club' and serves as an exclusive distributor for key game developers in various regions. It also owns Playcaso, an iOS and Android developer/publisher brand, a work-for-hire apps studio called nzLabs and gCity, a social gaming platform. Its customers include mobile carriers, as well as handset manufacturers. In April last year, Nazara entered into a partnership with the gaming giant Electronic Arts (EA) to bring the EA mobile games catalogue to the mobile phone users in the Middle East. As part of the agreement, Nazara was given the exclusive rights to distribute the EA mobile catalogue across all carriers, third party channels, aggregators and retail channels in the Middle East. The company had earlier entered into a similar partnership with EA for India, Sri Lanka and Bangladesh. "With high penetration of mobile subscribers, the availability of trustworthy mobile payments has an immense potential in developing countries," said Sameer Merchant, president of Opera Commerce. While he did not mention any name, Merchant added that the company is planning to partner with more mobile content providers like Nazara in the future.